Are mega-table PC's on the horizon? 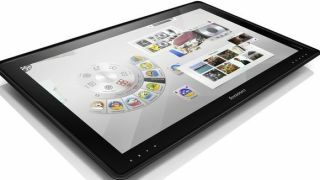 Lenovo came to CES aiming to do something different, or one can surmise that from the company's pre-official CES announcement for the IdeaCentre Horizon table PC, a 27-inch beast of an interpersonal computing machine. The flat-lying all-in-one PC is marketed as a multi-user, multi-touch, multi-mode device for the home that turns personal computing into "a shared experience" - gather 'round the kitchen table to play and interact. What is borne of that idea is a screen that two or more people can use at the same time and supports interactive physical gaming accessories. What we're looking at here is a table PC designed to get family, friends and whomever you want to game with playing on a touchscreen device. Horizon runs Windows 8 so naturally comes with 10-point multi-touch touch capability. Lenovo even threw in some pre-loaded, customized games from EA and Ubisoft to get game night cracking. Did we mention Horizon has a 27-inch screen? That's among the beastiest of the table PC's specs, but it also packs a processor up to an Intel Core i7, Nvidia GeForce graphics and the screen is a respectable full HD with 1080p. Considering its size, it's a mere 1.1-inches thick...but weighs 17.8 pounds. The Horizon does have a kickstand that takes it from horizontal to vertical and can be adjusted to view/play at different angles. Lenovo is including an e-dice, four joysticks and strikers to get users playing on a digital monitor while physically interacting with the game at hand. Lenovo also gave a peek at a concept table PC known as "Gamma" to demonstrate all the fun multi-user entertainment a mega screen can provide. Horizon will be available sometime in the early summer (no details yet on exact locals) and will start at approximately US$1,699. We'll attempt to wrap our arms around this beast soon so stay tuned for our hands on review.